Digestive disorders can be extremely embarrassing and debilitating. Conditions such as irritable bowel syndrome, small bacterial overgrowth and ulcerative colitis are increasingly more common and can be difficult to manage. An evidence-based clinical approach gaining popularity is a diet low in FODMAPs. This diet can be effective for improving digestive disturbances because it repairs the harmonious relationship of the gut with the immune system (1). More research needs to be conducted to identify all the biological mechanisms involved. FODMAP is an acronym for naturally occurring Fermentable Oligo, Di- and Monosaccharides and Polyols. These include the short-chain carbs glucose, fructose (present with excess glucose), galactans, polyols and lactose found widely in foods. Galactans are the primary carbohydrate found in beans, lentils and legumes. Disaccharides: Foods high in the carbohydrate lactose include dairy products like milk, yogurt, kefir and soft cheese products. Monosaccharides: Fructose containing food sources such as mangoes, apples, honey, pears and watermelon. Polyols: Also called “sugar alcohols” these carbs are often found in processed foods under the guise of sorbitol, mannitol, xylitol, maltiol and erythritol. Other foods that have polyols include pitted fruits like avocado, apricots, cherries, nectarines, peaches and plums. FODMAPS are not easily absorbed and challenging on the bowel. Fermentation in the large intestine causes a release of gases (primarily hydrogen, carbon dioxide and methane) that can result in minor bloating which is normal. However, the prevalence of FODMAP foods, especially in specific cuisines like Asian or Italian, can quickly cause excess bloating, abdominal pain and flatulence in people with a sensitivity. These sugars are small and osmotic which means that they attract water into the small bowel accounting for some symptoms outlined below. A conservative calculation estimates that more than 20% of people in industrialized countries have a food intolerance or food allergy (8). Some individuals who struggle with chronic digestive disturbances can point to a food trigger. Others struggle to identify the cause even when eating foods in part of a healthy diet. Individuals who suffer from digestive upset due to FODMAPs have evidence of altered gut microbiota. Fermentation in the colon contributes to immune activation, increased gut permeability, reduced luminal pH, and a weakened threshold for abdominal discomfort referred to as visceral hypersensitivity. Although not all of the physical and physiological mechanisms are clear, chronic digestive conditions stress the entire body and weaken the immune system. SIBO: Affected individuals have a condition called small intestinal bacterial overgrowth (SIBO) in which the digestive system is loaded with pathogenic microbes (3). FODMAPs are a fuel source for these microbes which release toxic byproducts as they metabolize the sugars. This toxicity causes digestive discomfort and overtime leads to different health challenges. Diverticulitis: Tiny pouches called diverticula concentrate the colon. When inflamed the resulting infection causes diverticulitis. Gastrointestinal endocrine cells utilize “chemosensing” to release hormones. These signaling molecules cause the gut to absorb nutrients, cause a protective response or activate neural pathways (10). Who Should Try a Low FODMAP Diet? A low-FODMAP diet is not recommended or suitable for everyone. Many of the FODMAP foods are rich in prebiotic fiber that feed the healthy bacteria residing in your gut. This may be the reason why research finds a lower diversity of gut bacteria in people who restrict FODMAPs. Don’t let this prevent you from learning if a low FODMAP diet works for you! Broadening our clinical view is key to understanding that there is more to gut health than bacteria. People are treating their digestive problems and healing the gut with a low FODMAP diet. To understand if you can benefit from a low FODMAP diet, do any of the following concerns apply to you? I have been diagnosed with a digestive disorder and/or my doctor has ruled out diseases like colon cancer. I experience digestive discomfort shortly following eating. I restrict common allergens like wheat and dairy but still experience chronic, digestive upset. I have a histamine intolerance. Stress seems to exacerbate my symptoms. The first phase to implementing a low FODMAP diet in your life is to learn what foods are triggering your symptoms. This initial step is the same for all individuals because it involves the restriction of all high FODMAPs for a period of 2-6 weeks. Remove inflammatory foods such as gluten, dairy, unfermented soy, peanuts and often nightshade vegetables and substitute them with low FODMAP alternatives (4). The diet also removes foods high in fructose such as lots of fruit (often lemon/lime and small amounts of berries are tolerated), honey and agave nectar. Remember, these restrictions are only temporary until you identify FODMAPs that affect you. In this second phase you will learn what FODMAP sources you are most sensitive to consuming. Over the period of 8-12 weeks you will reintroduce one FODMAP food into your diet at single time and for over the course of three days. Day 1: Re-introduce ½ serving of one chosen, and perhaps your most missed and desired FODMAP food with one meal. Be alert for any sensitivity or discomfort the food causes and remove it from your diet if symptoms reappear. Day 2: On the second day I recommend adding in one full serving of the same FODMAP food and again test for sensitivity. Day 3: If you don’t notice any discomfort by day three eat another full serving. If it is tolerated well, you can safely add this FODMAP food into your diet. Otherwise, remove the food from your diet entirely or test how well you can tolerate the FODMAP in smaller portions. Repeat the above steps while monitoring your tolerance level to each reintroduced FODMAP. Food tolerance changes over time and especially as you repair your gut. It is important to re-assess your FODMAP intolerance in 2-3 months and personalize a low FODMAP plan that works for you. The low FODMAP diet is not meant to restrict high FODMAP foods long term. Instead, the low FODMAP diet is designed to help you achieve a balance between FODMAP rich foods and the avoidance of main triggers. You may learn that your body cannot tolerate one category of FODMAPS like galactans. 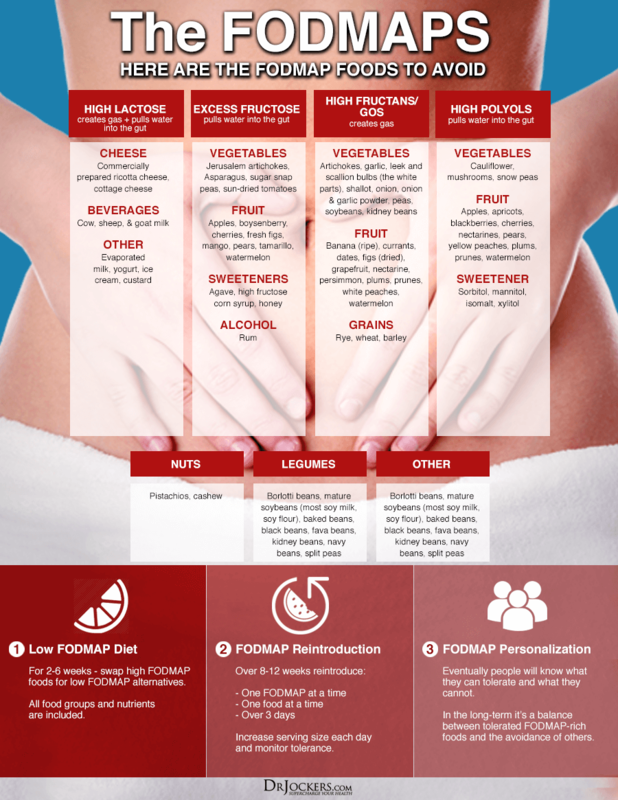 The typical nutrition plan for someone struggling with digesting FODMAPs is somewhat restricted but not hard to follow and customize. Breakfast can include a protein shake with coconut milk, berries and collagen protein powder. One could also do pastured eggs cooked in coconut oil with kale or spinach, herbs, fresh squeezed lemon and herbs. For lunch these individuals could do a big salad with olive oil and pasture-raised chicken or turkey. For dinner they could do a small salad with cucumbers and grass-fed beef or wild-Alaskan salmon or another quality animal protein with olive oil, fresh lemon and herbs. They could also do soups and stews with chicken, zucchini, carrots or squash and herbs. This nutrition plan does not have to be lifelong but should go on for at least 2 weeks and up to 3-6 months or until the digestive system heals. The use of certain gut enhancing supplements that help to destroy pathogenic microbes and repair the gut lining will speed up the process. Many individuals with digestive problems at some point in their life notice they always function better by minimizing their exposure to FODMAPs. Many others find that the main culprit is lactose or fructose. By staying on a low lactose or fructose diet they are able to keep their digestive system under control. For instance, some individuals have a dairy intolerance typically related to the protein casein. Pasture-fed butter and ghee are usually tolerated compared to kefir and yogurt although. I recommend avoiding all dairy for at least 30 days before adding small amounts back into your diet. It is always a good idea for individuals with digestive issues to use organic bone broth and make soups and stews. The bone broth provides raw materials that help to repair the intestinal lining and does not contain any of the FODMAP sugars. Organ meats are also highly advisable because of their rich nutrient content. Many individuals with digestive disorders find great success using intermittent fasting strategies such as eating one or two meals per day and doing lots of hydration during the non-eating periods. They also remark about the great relief they get from the nagging symptoms when they follow these nutrition principles. Such a helpful article!! Thank you! You mentioned supplements for the gut… Is there a particular supplement that helps address the SIBO specifically? Maybe Probiotics (s. Boulardii) or Enzymes (HCL)?? I find that one drop of lemongrass essential oil in water can help reduce epigastric pressure when I have eaten a trigger, but would like to have an effective strategy to overcome the SIBO (maybe by avoiding these foods?)! Thank you so much for clarifying! These products have specific compounds, essential oils and probiotics in them that help to destroy bad microorganisms and enhance healthy microorganism count in the gut. Both are great cleanses to do…but bone broth probably has more benefits! thank u!! I read all ur article on the healing properties on bone and beef marrow. ur website is my favorite! I too like your posts, but, find many posts by medical specialist very generalist when dealing with GIT issues. “If you follow the principles” your gut will get better in time. So sorry to hear about your condition Silvio! None of my articles are written with the idea that these strategies work for everyone, just for most population groups. Everyone is different and unfortunately, there are many factors that must be addressed to get well. We are praying for you and believing the best for you! Can I make homemade bone broth with onions & strain them out of the finished broth & assume the fructans will not be present? I use a onion & garlic infused olive oil that is sold as FODMAP friendly. So I assume the fructans are in the physical onion & not in the juice that make cook out of the onion? Do you know? Thanks! Hey Alison that is a great question. Fructans are water soluble so unfortunately that could still pose some problems. They are not fat soluble which is why the infused oil is FODMAP friendly. I hope that helps! What can someone with SIBO eat??? Low fomaps fine but what to eat??? What is recommended for a vegetarian facing chronic constipation with gas and bloating? Hey Vidhu, I’d start by supplementing with HCL, Ox Bile, and digestive enzymes. Also increasing dietary fats and drinking plenty of water (away from meals). Magnesium supplementation would help as well. If it continues then you will want to look into running some functional lab work! Dear Dr. Jockers, I see that you have experience with persons dealing with SIBO. This is conforting. My wife has made the antibiotics cure for 1 week, took probiotics for 3 weeks. With probiotics seen some improvements. But now, she will do a second Atmen Test. She is still not good. 1.What would you recommend as treatment? 2. Do you know of people with Sibo that recovered? 3. I heard it takes at least 6 month for intestinal flora to regenerate?